The American Classic took place July 1, 2011, at the USA Gymnastics National Training Center in Houston, Texas, and is a qualifier to the Visa Championships, Aug. 17-20, 2011, in Saint Paul, Minn. In the senior international division, Grace McLaughlin of WOGA won the all-around title with a score of 56.300. Jessica Howe, also of WOGA, took second in the all-around with a score of 55.300. Howe tied for first on floor with HallieMossett of West Coast Elite, both scoring a 13.850. Brandie Jay of GK's finished third in the all-around with a score of 54.250. Jay won the vault title, scoring 14.550. Anna Li of Legacy Elite won the bars title with a score of 15.150. Casey Magee of Capital in Texas won the beam title with a score of 14.600. The senior qualifying score for Visa Championships is a 54.000 in the all-around, 41.250 for three events and 28.000 for two events. McLaughlin, Howe, Jay and Mossett qualified to the Visa Championships, as well as McGee, Li and Sophia Lee of WOGA based on their scores at the American Classic. In the junior international division there were two sessions. 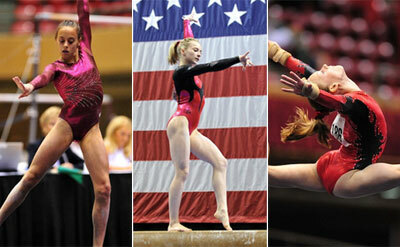 In the first session Mykayla Skinner of Desert Lights won the all-around title with a score of 54.650. Mackenzie Brannan of Capital Texas took second with a score of 54.150 and won the floor title with a score of 14.100. Simone Biles of Bannon’s took third in the all-around with a score of 53.650 and won two event titles, vault (14.950) and beam (13.950). Brianna Brown of Cincinnati Gymnastics won the bars title with a score of 13.600. In the second session, Abigail Milliet of Denton Gymnastics won the all-aroundwith a score of 55.800. She also earned the titles on vault (14.700) and tied for the bars title (14.250) with Mary Maxwell of Texas Dreams. Maxwell tooksecond in the all-around with a score of 53.800. Polina Shchennikova of Tigar Co. took third in the all-around with a score of 53.250. Lauren Marinez of Orlando Metro won the beam title with a score of 13.850, while Bailie Key of Texas Dreams won the floor title with a score of 14.050. The junior qualifiying score for Visa Championships is a 52.500 in the all-around. The juniors do not have a two- or three-event qualifying score. The following qualified to Visa Championships based on their all-around scores: Skinner, Brannan, Biles, Meredith Sylvia of Parkettes, and Brown. From the second session the qualifiers were: Milliet, Maxwell, Shchennikova, Marinez, Key, Peyton Ernst of Texas Dreams, Samantha Partyka of Champion TX, Maggie Nichols of Twin City Twisters, and Macy Toronjo of Texas Dreams.